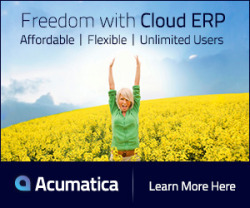 The Acumatica Inter Company Accounting module, allows you to track financials and create reports separately for an unlimited number of related companies within your organization. Related companies share chart of accounts, calendar, currency, and non-financial data. Related companies may also be referred to as “branches”. The system will automatically create due-from and due-to entries for inter-company transactions so your accounts stay in balance, and your consolidated reports accurately reflect company-wide results. Inter-Company Accounting is integrated with the Financial Suite, Distribution Suite, and Project Accounting. Acumatica Inter-Company Accounting does not apply to stand-alone companies which allow you to decide what elements should be separated or shared between them, such as chart of accounts, customers, employees, etc. Stand-alone companies may also be referred to as “entities”. Reduce overhead by centralizing accounting functions such as cash management, vendor payments, and customer invoicing in a single company. Income and expenses are attributed to the company that initiated the transaction. Deliver customized reports across one, many, or all companies with integrated query and reporting tools. Financial reporting tools eliminate inter-company transactions on company-wide reports. Create roles and groups of users that have access to specific companies and the associated transactions. Add users to specific companies in seconds. Users with access to multiple related companies can rapidly switch views without logging in again. Account Based Controls: Define which accounts allow inter-company transaction accounting. For example, you may allow inter-company transactions for your balance sheet accounts while excluding others. Centralized Purchasing and Invoicing: Integration with the Accounts Payable (AP), Accounts Receivable (AR), and Sales Order Management (SO) modules enables centralized purchasing and invoicing. Companies can purchase items and create sales orders that are approved by and associated with other companies. Company Bank Accounts: Link bank accounts to specific companies so the account can be used exclusively by that company. Integration with the Cash Management (CA) module allows you to assign cash accounts to specific companies. Asset Transfers: Integration with the Fixed Asset (FA) management module allows you to assign and track fixed assets to specific companies. When assets are transferred, depreciation and purchase history moves with the asset. Account Allocations: Allocate account transactions to other companies to associate shared activities among multiple related companies. You can perform allocations automatically according to your definitions.